An emotional Cristiano Ronaldo had his son Cristiano Junior by his side on Monday while accepting the 2013 FIFA Ballon d’Or award at a gala ceremony in Zurich. During his acceptance speech the Real Madrid footballer thanked all of his team-mates with the club and the national team. 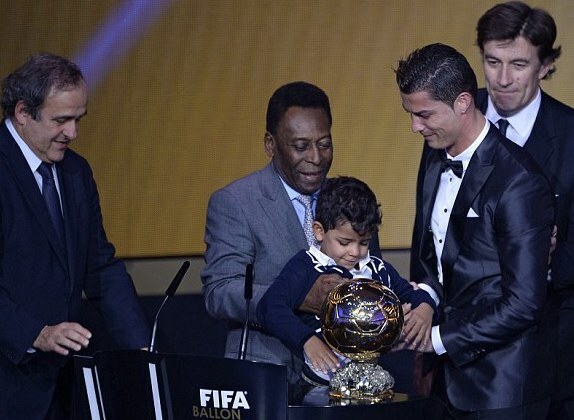 Honorary Ballon d’Or recepient Pelé lifted Cristiano’s son Junior up to kiss his dad when the speech was done. The speech was delivered in Portuguese, and translated to the crowd in English. Almost immediately the words set off rumors that Christiano had secretly married his girlfriend Irina Shayk. 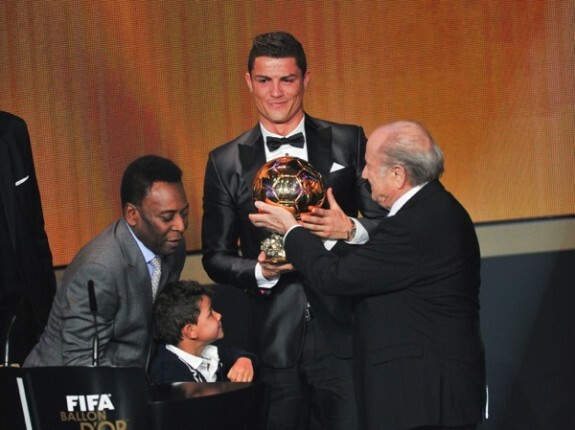 This is the second Ballon D’or for the footballer, who also took first place in 2008. Having his son by his side likely made this win the best of the two.